We already knew Americans rank Congress below cockroaches and Nickelback, but a new poll provides further evidence of just how little love the public has for the legislative branch: its ratings are worse than Jar Jar Binks'. FiveThirtyEight asked an online SurveyMonkey poll of Star Wars watchers to rate the films' characters. The least popular, reviled Gungan representative Jar Jar Binks, had a 29 percent favorable rating, with 37 percent viewing him unfavorably, for a net -8 (the rest were neutral or undecided). By contrast, public polling gives Congress an average net rating of about -57. In the interest of fairness, it's perhaps important to note that the Star Wars poll included an explicit "neutral" option, which many political polls do not. 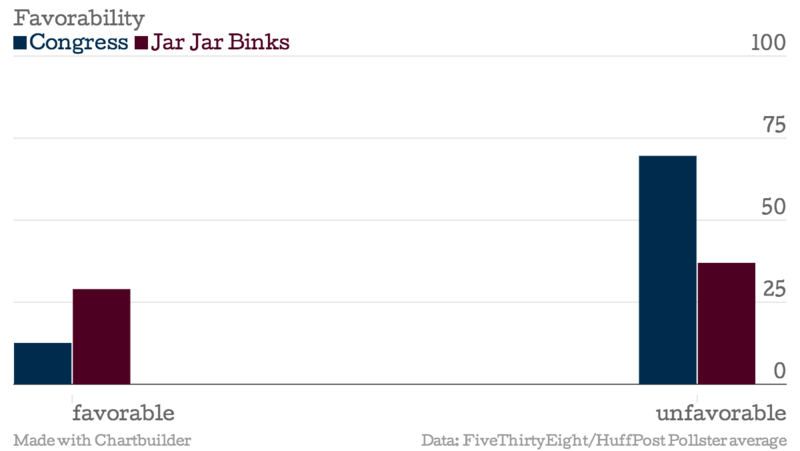 Also individual representatives, like Jar Jar, generally poll better than Congress as a whole. For all the comedic potential Congress' low approval ratings provide, most of its members are likely to be reelected. In 2010, when just 21 percent of Americans approved of Congress, 85 percent of House incumbents seeking reelection held onto their seats.